Line cookie sheet with plastic wrap. Place white chocolate baking bar in medium microwave-safe bowl. Microwave on HIGH for 30 seconds. Stir; continue to microwave in 15-second increments until chocolate can be stirred smooth. Stir in corn syrup. Spread mixture into 1/2-inch-thick layer on plastic-lined cookie sheet. Let stand at room temperature for 1 hour or until firm. Meanwhile, heat oven to 350°F. Line 24 muffin cups with foil or paper baking cups. In large bowl, combine cake mix, water, oil and eggs; beat at low speed until moistened. Beat 2 minutes at high speed. Divide batter evenly into foil-lined muffin cups. Bake at 350°F. for 20 to 30 minutes or until toothpick inserted in center comes out clean. Cool in pans on wire rack for 15 minutes. Remove cupcakes from pan. Cool 20 minutes or until completely cooled. In medium saucepan, heat semisweet chocolate and butter over low heat until chocolate has softened and butter is melted; mix well. Dip top of each cooled cupcake in glaze. 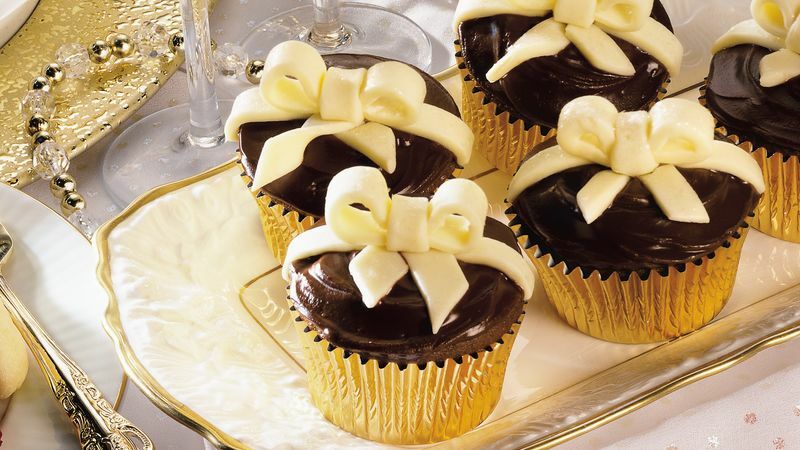 To decorate cupcakes, squeeze and knead white chocolate mixture with hands until workable. Roll mixture between sheets of waxed paper to about 1/8-inch thickness. Sprinkle with edible glitter; cover with sheet of waxed paper. With rolling pin, press glitter into surface of white chocolate mixture. With sharp knife or pizza cutter, cut mixture into 3/8 to 1/2-inch-wide strips to form ribbons; shape into bows. Top each cupcake with bow. Keep any remaining white chocolate bow mixture to decorate other desserts. Form it into a small rectangle and store it in a resealable food storage plastic bag at room temperature for up to 2 weeks. To use again, knead it briefly until it is softened.